Aquarius are often great visionaries and dreamers who do not tend to respect traditional values and knowledge of the past. Famous Aquarius are for example Charles Darwin, Thomas Alva Edison and Galileo Galilei. Each of them did enough to turn science over. Aquarius do not judge you according to their first impression. They will be frank with you, but they will not tell you how you should live. Aquarius know that everyone has his own ideals and desires. Aquarius live in the sky (their element is the air), so you can sometimes see them sitting on a rainbow, pouring streams of their fantasy down onto the ground. Aquarius do not like to make any commitments, so they feel uncomfortable when they have to schedule an appointment or a deadline for project delivery. Aquarius leave things rather open and want to have the back door unlocked. Aquarius is not the one who goes first with a flag into the battle. Instead of real warfare he prefers to meditate under a tree and wait for enlightenment like the Buddha. Male Aquarius is attracted by mystery. The woman who wants to get him has to arouse his curiosity first. Thus, reading an open book is no challenge for the Aquarius man. Men born under Aquarius do not like purposeless gestures. Instead of a rose bouquet, he will give you a single dandelion with a smile on his face. Female Aquarius ­expects you to be interesting and entertaining. She lives for the present. To be bored with an old millionaire and wait for him to kick the bucket is really not her style. Aquarius unfortunately often suffer from lack of permanent feelings. It is characteristic for them, because Aquarius element is the air. Even though they canget really excited for things deeply, it often does not last long. Aquarians are often the great visionaries and dreamers who do not acknowledge the values and lessons of the past with the proper respect. Among people born under the Aquarius zodiac sign you can find Charles Darwin, Thomas Edison or Galileo Galilei. And each of them did enough to turn the science upside down. Aquarius will not judge you according to the first impression. He or she likes freedom and independence and usually the same values respects also by others. Thus, tolerance is very characteristic for a typical Aquarius, if you let him / her live with own different opinions. They will be honest with you, but without advising you how to live. Aquarians simply know that everyone has own ideals and aspirations. People born under this zodiac sign live in the sky (the air element), and occasionally you will see them sitting on a rainbow and pouring currents of vivid imagination on the ground. Aquarians talk a lot about their plans, but the realization fails from time to time. Because they often have more things to pursue than any other zodiac sign during the lifetime. The boundless fantasy is simply a characteristic feature of Aquarius. Rarely you will find Aquarius, which would enjoy the dull and boring work. For example, they usually have no desire to be a clerk or a fast food vendor or to answer customer's phones at the reception. Bureaucracy and boring routine is characteristically against the grain by Aquarians. Gladly they do something really interesting, useful and necessary, what others really need and appreciate. Aquarius is reluctant to obligations, so people born under this zodiac sign feel uncomfortable when they have to tell a fixed date of the appointment or project delivery. Aquarius leaves many things open and wants to have a back door. The strictly organized character is not very typical for them. Ideally, when there is at least one another person that is able to complete the dreams of this creative genius to the successful end. Although Aquarius often believe in the potential to change the world for the better, he or she leaves the activity to others. The fighting spirit is not very characteristic for this rather humanistic sign. Aquarius is not the one who goes with the red banner first into a battle. Instead of an actual warfare he or she prefers to meditate under a tree and wait for enlightenment as the Buddha. 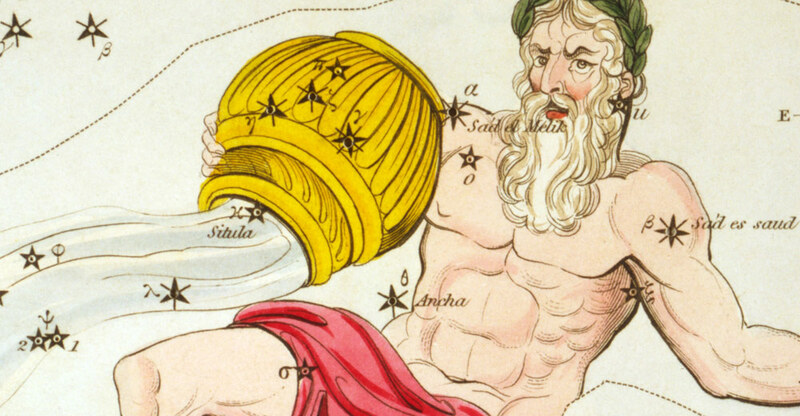 The Aquarius man is well known for his joy of new and unusual knowledge and experience. He loves experimenting. The Aquarius man is a freethinker. Idealism is one from his typical personality traits. The Aquarius man prefers thoughts before the hard work or even before owning the property. He likes to sit in peace, dreaming. This man has usually a freedom loving and independent personality. The Aquarius man is an enthusiast. He loves the nature and the movement of the wind in the trees. Aquarius is trying to have good relationships with everyone. Only few are selfish and petty. Aquarius men are tempted by secrets so you can find them solving crosswords with a pencil, in the queue at the new exhibition, or with a magnifying glass in the woods looking for tracks of deer. Inventiveness and curiosity are typical personality traits of this zodiac sign. The woman who wants to get such man, must arouse his curiosity first. To read an open book is no challenge for the Aquarius man. Thus consider what bait you could prepare for this Sherlock Holmes. Inviting the Aquarius man to a contest in the geocaching (treasure hunt using GPS) might be better adventure than a joint visit to an unknown café. Prepare, however, that self-serving or spectacular gestures are not in agreement with his personality. Instead of a bouquet of roses he might give you one single dandelion with a tricky smile. The life of the Aquarius men will be almost certainly full of change, conflicts and unexpected events. But such personality traits may not be the best foundation for a role of the breadwinner. When the Aquarius men gets rich, it is often a coincidence, a good luck, and not his extreme desire to be wealthy. He is able to invent a flying steamer, a miraculous suit that will never be dirty, or cushioned shoes that will run almost by themselves. But it is essential that during all his constant speculations and fantasies he is often not capable to slather a bread or prepare a cup of tea. The Aquarius men will therefore also need someone to care for him. And it can be just you! The Aquarius woman is an excellent head of the family. She is interested in human rights, social issues, politics and education for the general good. Sometimes is she impatient and explosive. The Aquarius woman can be nervous when things do not progress according to her will. The Aquarius woman is able to provide moments of peace, stability and support for the man and whole family. These women enjoy surprising everybody around. To be original, witty and inventive – such are the main personality traits of Aquarius women. Their fantasy is without borders. Such a woman born under the sign of Aquarius can easily enter the convent, travel with the Red Cross to help Africa, or become a driving instructor. Sometimes, unfortunately, Aquarius women suffer from the lack of lasting feelings. It is a common feature of every zodiac personality with the air element. Although the Aquarius woman is able to become deeply enthusiastic about something, it is not for long. The wind simply blows the initial passion away or brings something new and very different, what will attract her attention even more. The typical Aquarius woman will not be interested much in your credit card limits or in the amount of your savings. She expects that you will be an unusual, impressive, lovely, amusing and a bit provocative man (she is looking exactly for such male personality traits). She lives for the present. To be bored with some old multimillionaire and wait for his last breath, that is not her style. If you want to engage her attention, do something romantic and a little bit mad. Do you think it is funny and appealing, when Vincent Vega (John Travolta) in Pulp Fiction invites the wife of his boss on a milkshake at the special bar, where Hollywood stars from the fifties serve? Or when Rocky (Sylvester Stallone) invites Adrien to an empty ice rink in the night? Certainly you have to come up with something equally original to attract the woman born under the sign of Aquarius. For example, to take a balloon flight costs a lot of money, but hand on heart, you will remember such a date for the lifetime. The element of the Aquarius woman is the air, so you should look for something that will fluff up your hair by the wind. Good luck to you and we hope you will enjoy all extraordinary personality traits of this eccentric lady.